Apigee’s Sam Ramji pointed out to me today that Twitter did a first when communicating with developers yesterday about its new platform policies. For the first time in recent memory Twitter has used a graphic to actually illustrate what it sees as the acceptable and not so acceptable ways to use its API. The graphic is clear and to the point. When you look at the graphic, one thing is for sure, Twitter wants nothing to do with the enterprise. The blog post, and the reaction, to the say the least, is a sure example of the delicate nature of developer relations. It also reveals a lot about how Twitter sees its business. Here’s Twitter’s spin. Do you want to develop a consumer facing Twitter client? Well, you will be under some strict guidelines if so. But if you want to use Twitter for business, you are pretty much free and clear. So that means if you are analyzing tweets for sales people to get new leads then I’d say you are okay. If you want to develop a service that helps marketers target influencers then yes, go for it. 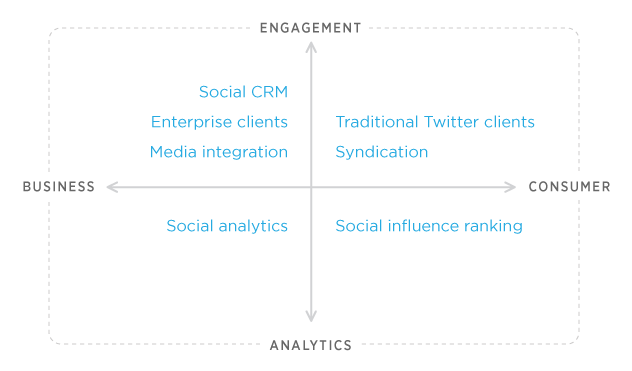 In the upper-left quadrant are providers of tools that help businesses engage with Twitter including social CRM providers like Sprinklr, HootSuite and Radian6 (acquired by salesforce.com), and integration companies like Mass Relevance, which aggregates and filters Tweets for display on TV. SocialPandas launched this week. It will use data from Twitter and other sources to give sales people better tools for building relationships. SugarCRM integrated Twitter last year. Datasift is a powerful Twitter data analysis and business intelligence platform. Twitter has no interest in the enterprise. For that matter, neither does Facebook. But as we well know, enterprise startups do very well when using Twitter and Facebooks as models. Case in point? Yammer sold to Microsoft for $1.2 billion. Considering that success, I’d say it’s a good thing for the enterprise entrepreneur that Twitter has no interest in the enterprise side of APIs.